Robert and I first met at the Ace in New York City in 2015 on a stormy night. We immediately bonded over our love for travel, dogs, and a desire to move to California. Little did we know, 6 months later, we would be packing our bags for a cross country trip to start our new lives on the west coast and taking on jobs in the tech industry. We quickly bought our first home together and started settling in. It wasn't long before we started planning our next trip, heading west once more but this time across the Pacific Ocean to the beautiful country of New Zealand, where Robert grew up. This was my first time meeting Robert's extended family and exploring the north and south islands. It was during this trip, on the shores of Lake Whakatipu in Glenorchy that Robert popped the question surprising myself and everyone we were with. Waiheke has always been a special place for Robert growing up as his family were keen sailors. They would often go on overnight trips all around the island and it was these early memories of the island with family that made it the perfect place to get married. Since it was partially a destination wedding, we wanted to make sure our traveling guests had a lot of information about activities to do during their stay. XOX Waiheke was an excellent resource in providing great recommendations and helping us tie everything together. 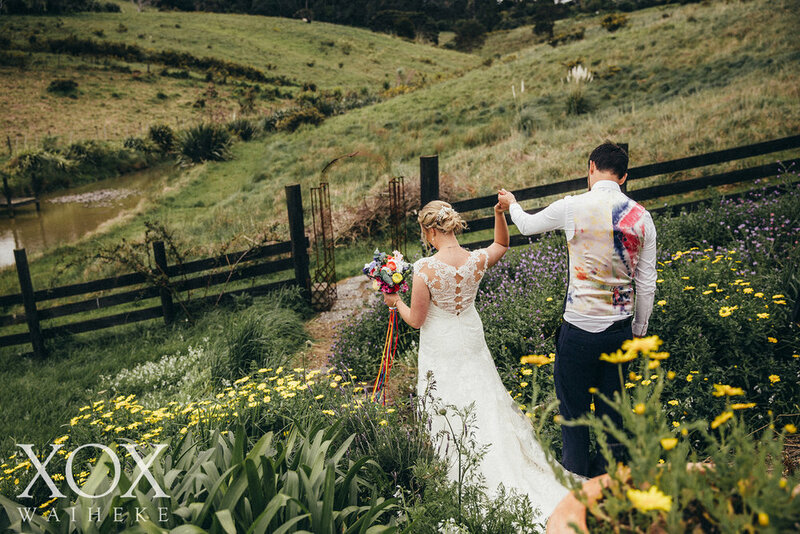 We learned very quickly that planning a wedding from another country can be difficult and XOX Waiheke made the process so much smoother. On the day itself, Robert and I were not involved with any of the logistics and were able to truly enjoy the moment! Since we were getting married in Autumn, we really wanted the day to feel warm and romantic. We stuck to richer colour tones like burgundy, navy, and gold with lots of candles everywhere. It was a formal wedding, including a black-tie optional dress code. We loved seeing our friends and family dressed to the nines! Since it ended up raining (which is an ongoing occurrence for all of our milestones together), we ended up having the ceremony in the covered courtyard at the lodge which brought greenery from the crawling ivy into view. The ceremony itself was beautiful and it was so special to have been able to incorporate some Jewish traditions and have all of our immediate family involved in different ways. Given the sun goes down earlier in May, we decided to take advantage of the daylight and have our couples photos taken prior to the ceremony - this ended up being such a lovely way to start the day and allowed us to go to multiple locations for our photos. 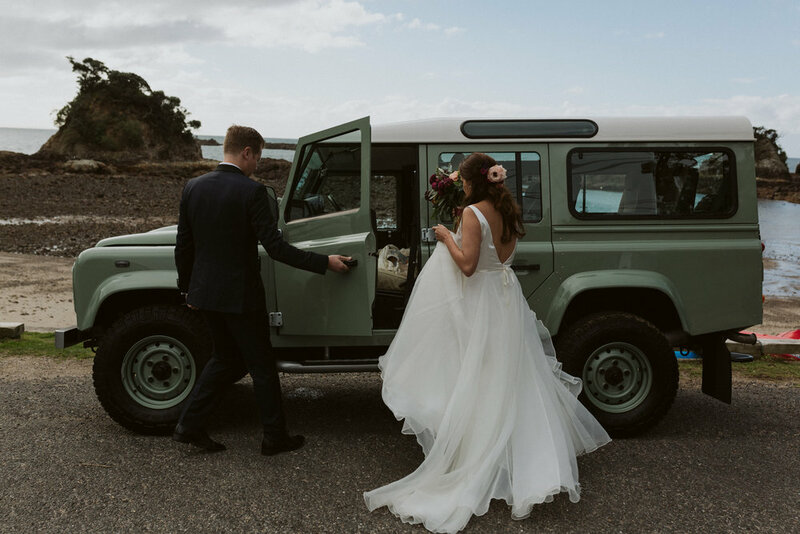 Robert's father also organized through a friend to borrow one of the last made Land Rover Defenders which made for a fun and memorable way of getting around the island! After the ceremony, we were excited for all of our guests to receive handmade yerba mate gourds (as my family is from Uruguay) from Factory Ceramics on the island. We also loved hearing from friends and family during speeches and eventually having Robert get up to DJ to close out the night. Tommo and I live on the North Shore in Auckland, we love escaping to Waiheke, getting into the sun whenever possible, doing work on our new house and spending time with our families. Tommo proposed at Man O’ War Bay one beautiful summer weekend when we’d bought over a bunch of my nearest and dearest Christchurch school friends. He had them all in on it – so while he whisked me away in private to drop the knee they were cracking into the champagne getting the after party started back at the house. It was just perfect. We’re lucky enough to go to Waiheke regularly as Tommo’s family have a holiday home in Palm Beach they designed and built themselves – we love coming across year round, usually with our wonderful little travelling cat Knuckles. We really wanted to take the opportunity to show our 100 guests the Waiheke that we’ve fallen in love with – a place with a kind, creative community, incredible scenery and delicious fresh food – it’s so much more than the vineyards! 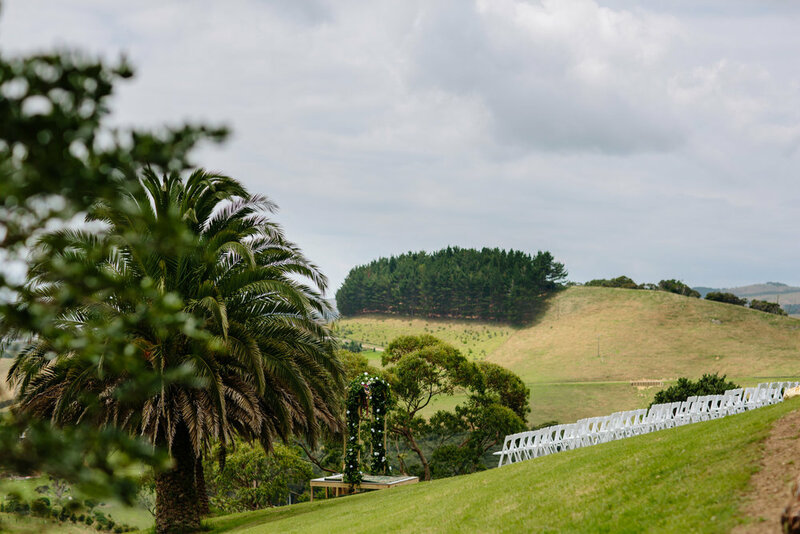 We spent a lot of time working on a detailed wedding website with our favourite local spots, from walks to wineries, shops and accommodation options which went down a treat with our guests and Waiheke turned on one amazing weekend of weather for our big day thankfully! 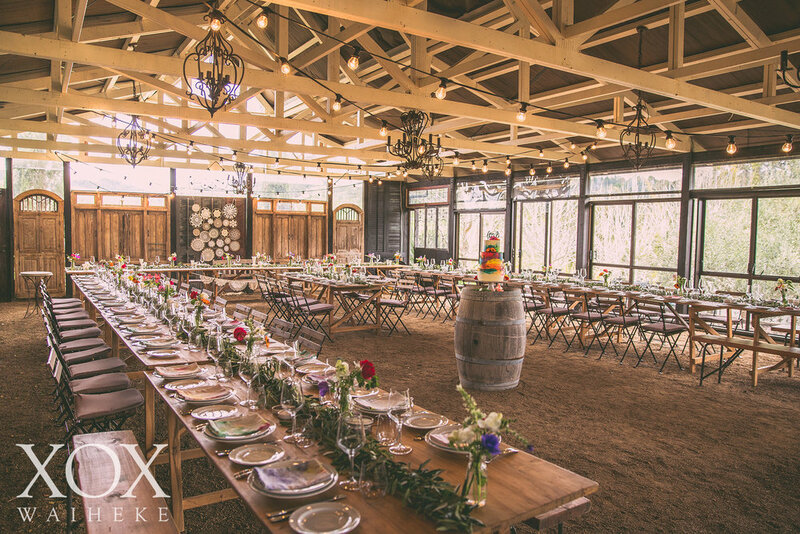 We were really specific with the kind of venue we wanted as we wanted to showcase the best of the island, have an incredible aerial view and have the ability to bring in a lot of our own vendors. After months of hunting we were thrilled when Tommo’s parents introduced us to their friends Sue and Gus who run The Nikau on Waiheke Road – it completely blew us away from our first visit. 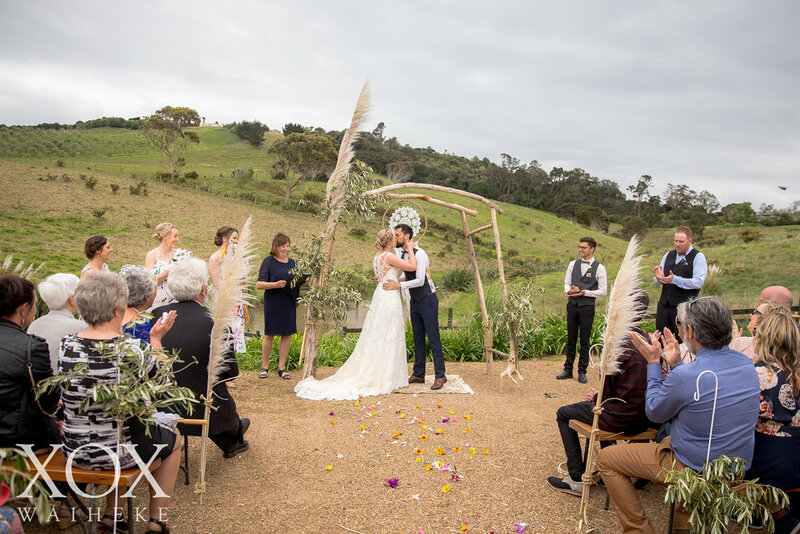 We were the first wedding The Nikau had hosted so there was a lot of wedding planning involved. I loved every minute of it. I’m a Brand Manager in my normal life so love seeing a vision come together, it was so rewarding and all the long hours paid off. 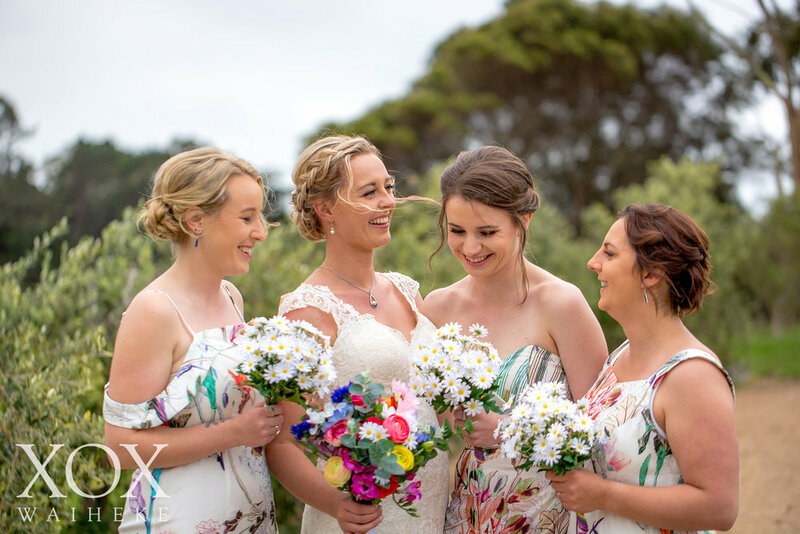 It was incredible to have Lauretta from XOX Waiheke along with us every step of the way – her knowledge of the island was invaluable and steered us perfectly throughout the year leading up to the big day. 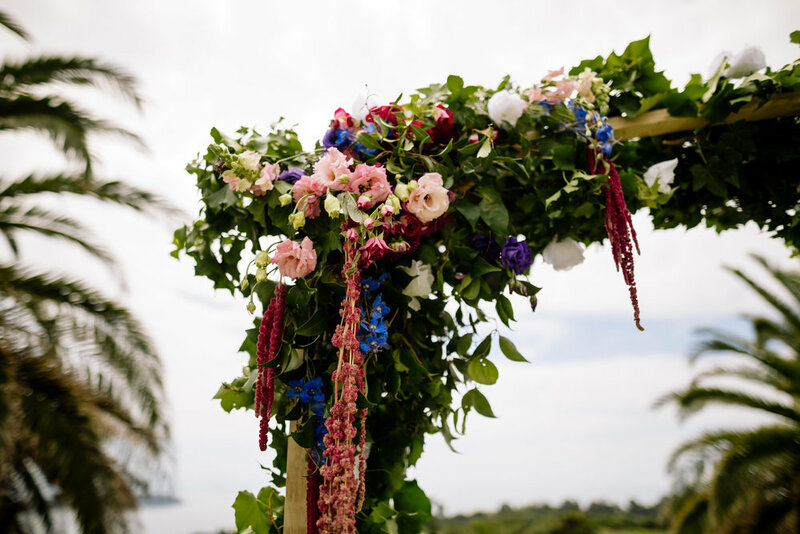 Thankfully we had the best décor possible – sunny skies and incredible 180 degree views over the island and ocean. 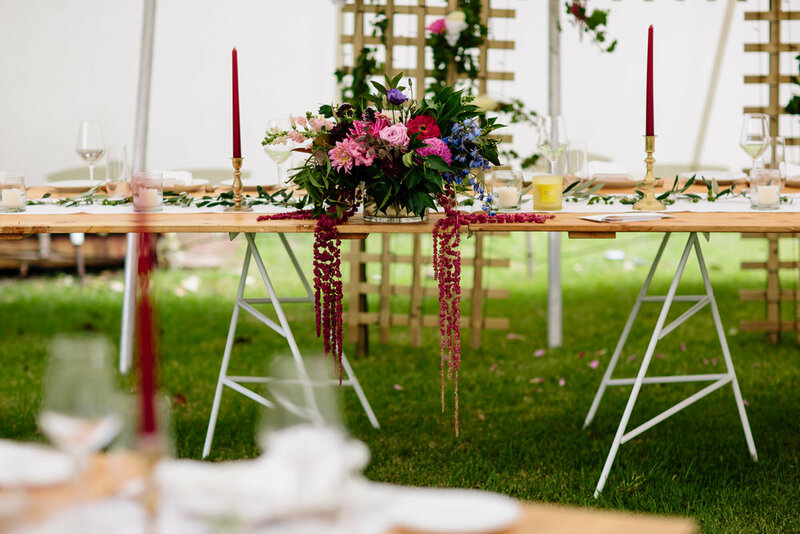 To complement this we went with a lot of white-on-white for simple elegance combined with dramatic and bold florals in deep reds, purples and blues, Vicki from Wildflower Waiheke did an incredible job. We avoided a specific ‘theme’ and stayed away from anything too ethereal, girly and pastel – that’s definitely not us! 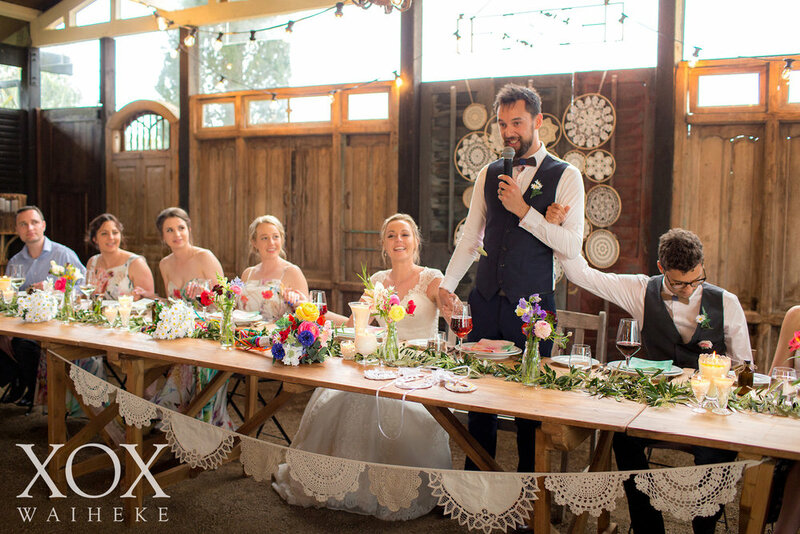 We also had special meaning throughout our décor – union jacks for my British family and menus on tracing paper as an ode to Tommo’s engineer Father plus our wedding arch was handmade by Tommo’s Dad and much of the other décor was by myself and my bridesmaids. 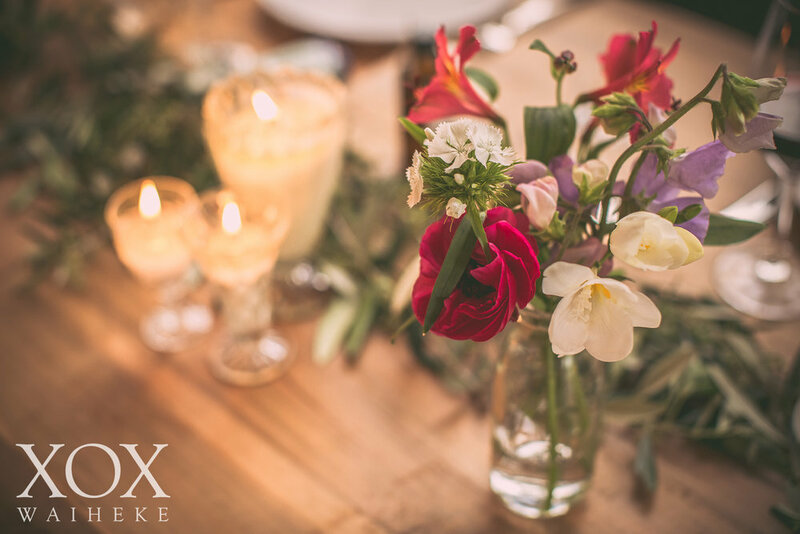 We dotted our favourite scented candles throughout the marquee reception - I think scent is super important to creating atmosphere. 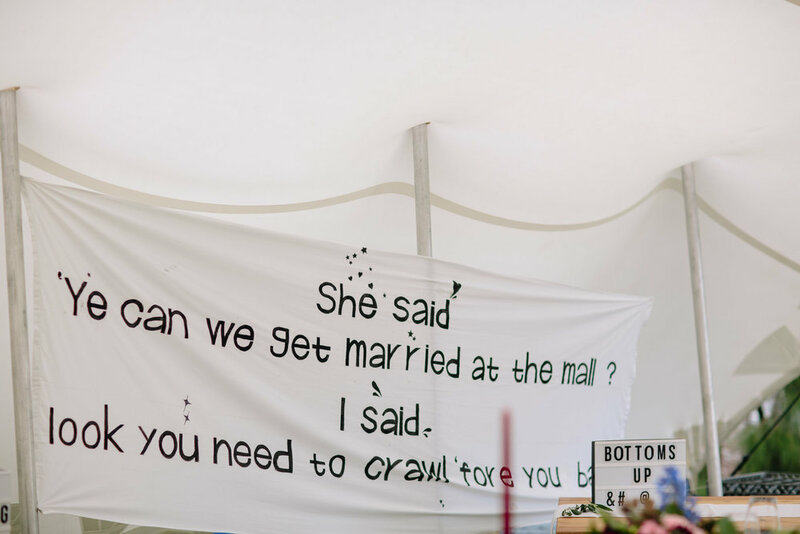 My incredible friend Jenny also bought the wedding style to life in all our wedding stationary including funny notes in the toilets, quirky signs on the wedding transport and more – she nailed it! Memorable moments of the day… We kept guest experience at the top of our list throughout planning so our big objective for the day was to create a happy and friendly vibe. 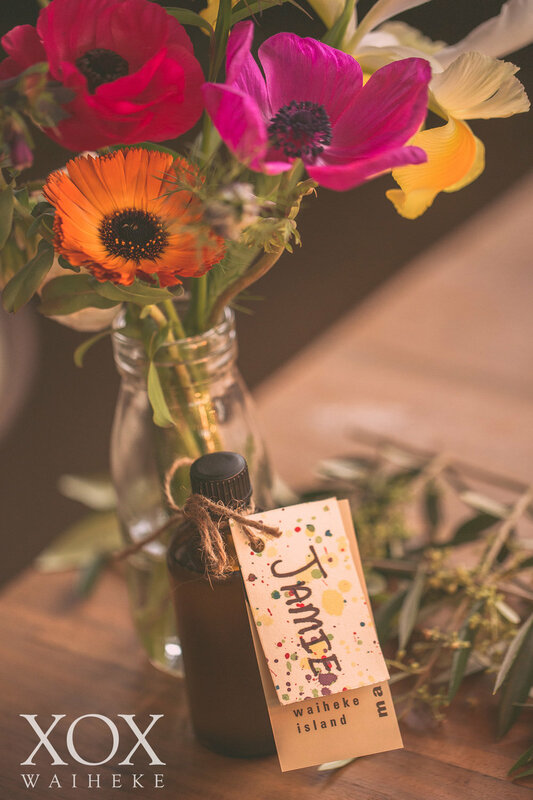 To get people making new friends we set up a human bingo game after the ceremony which encouraged guests to approach each other with odd questions to complete their cards – watching this take place was hilarious, super rewarding and just the best feeling! The ceremony was also one of the most memorable moments – there are no words to describe the intensity and all the love in that moment! Both our Grandmas were with me as we walked down the aisle - I carried my Grandma's brooch which has been in the family since the 1800's along with Tommo's Grandmother's high school brooch - we went to the same Christchurch high school and really bonded over that. Our speeches were for the books as well – there were some jaw-dropping one-liners from our folks. Finally our band Coachella were the most amazing fit, the party was the best of our lives. 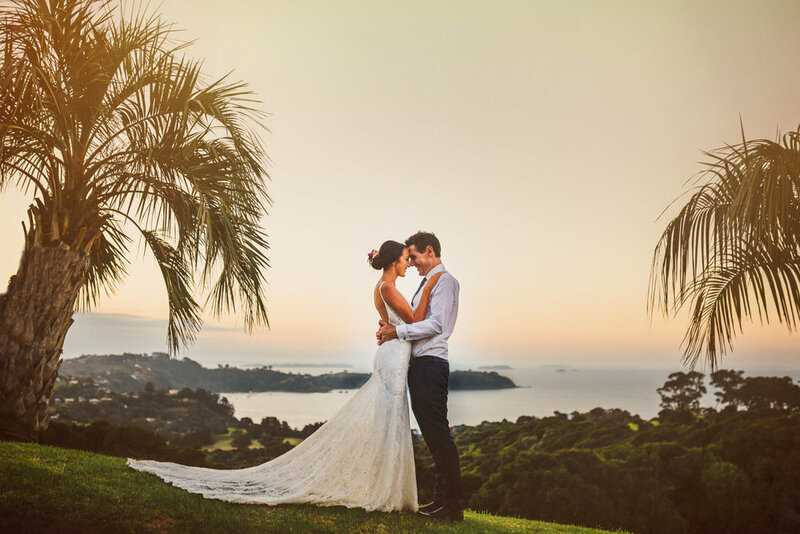 Advice for other couples planning a Waiheke wedding… Relax and buckle up! Try and choose as many local vendors as possible: they work together so well, it’s important to give back to the island and it avoids you paying for numerous car ferries and accommodation. The Boathouse and Charlies are perfect for relaxed pre and post wedding gatherings, and there is a retirement village in Ostend that will be thrilled with your leftover flowers. Some things will run on island time, allow yourself to relax and trust the experts. Face to face meetings with your island vendors go a long way so treat yourself to loads of site visits to the island - enjoy! 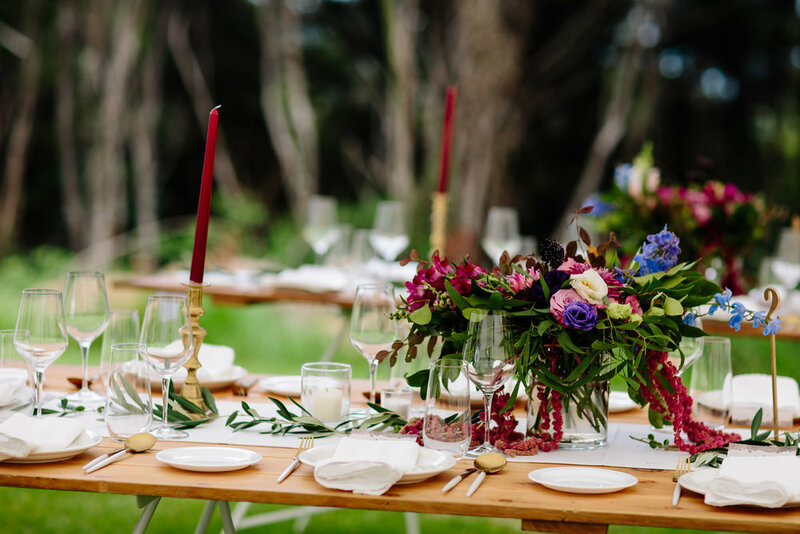 Do whatever you can to give your guests a great taste of the island outside of the big name wineries – how could they not love it! Finally, look at each wedding tradition and discuss if it’s right for you two so you’re not simply going through the motions – we limited our formal family photos, paid our musicians to learn our special songs and put the money that would otherwise be spent on wedding favours into a donation to the Women’s Refuge on our guests behalf. Any stand out suppliers? 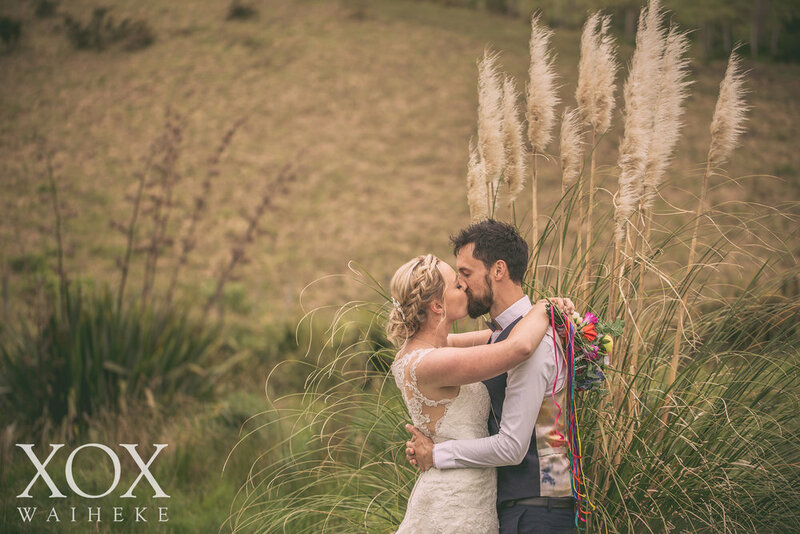 Our standout wedding suppliers were Lauretta from XOX Waiheke, The Official Photographers and Made With Love - I am so in love with that lace! Tazz and I met in 2008 in the Whitsundays where we were working at a small resort. 7 years later in Bordeaux, France Tazz proposed, it was the 2nd day of our two year working holiday visa for the UK so I had a long time to plan the wedding. We now live and work on Waiheke and absolutely love it, there is no other place we would want to live. Before we were engaged we had talked about marrying on Waiheke. We both loved it from the first time we visited, for Tazz he was a kid. His Aunty and Uncle live here. For me it was when we moved here for the first time in 2013. 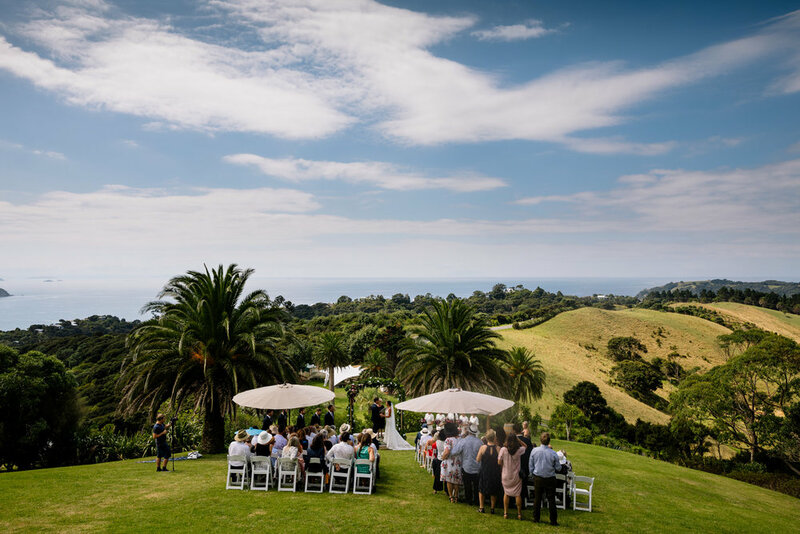 We had started the planning process by ourselves, in 2016 we returned to Waiheke for a friends wedding so took the opportunity whilst in the Southern Hemisphere to check out some possible venues. On return to the UK it was obvious that we were going to need help from someone on Waiheke. 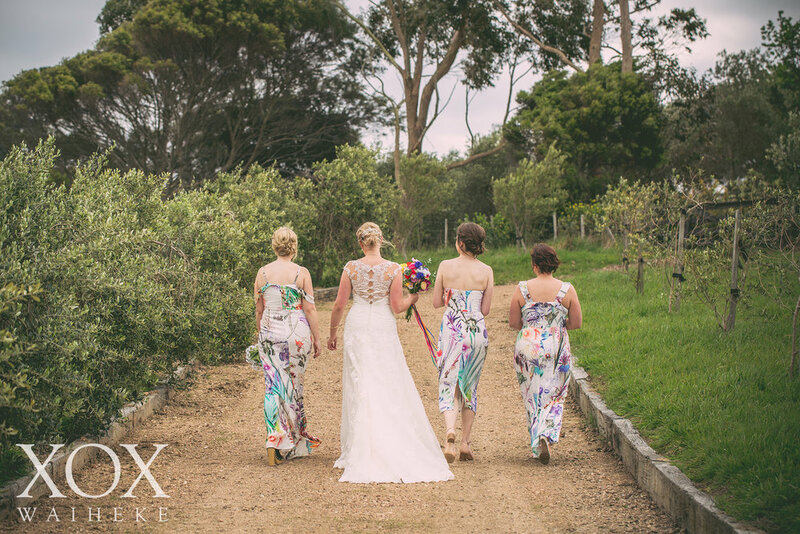 There is where we contacted Lauretta from XOX Waiheke and before we knew it had a wedding planner and photographer in one. 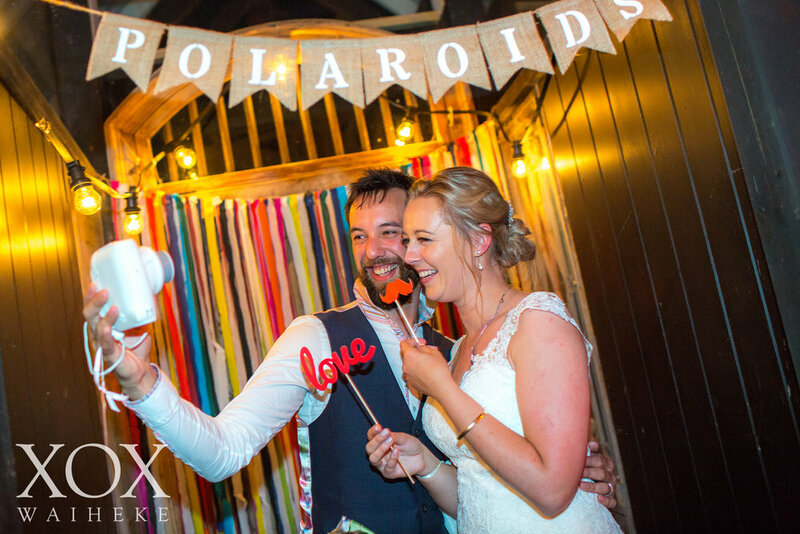 Lauretta thought of every little detail it was great, she had ‘To Do’ lists and timeframes, what felt like a massive overwhelming task instantly became exciting as we planned our dream wedding. Describe your wedding day style... Tie dye, doilies, colourful, casual. I’m obsessed with doilies and a Tazz loves his tie dye. 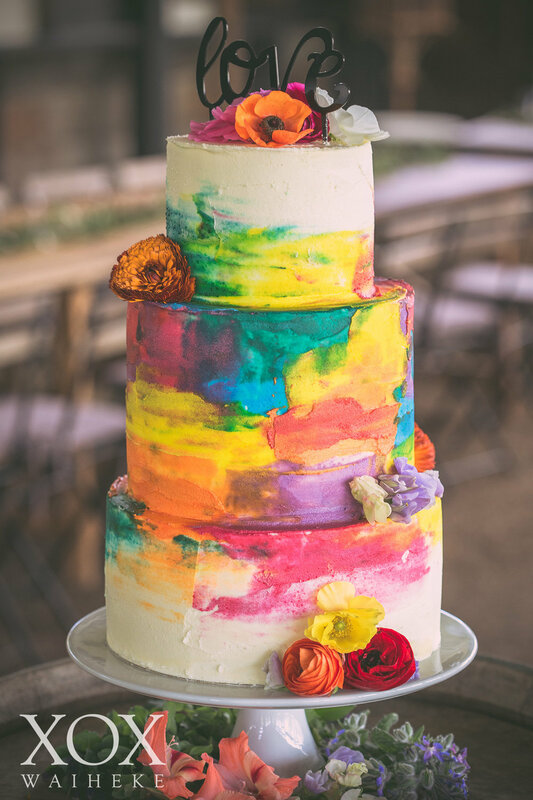 We didn’t have a strict theme or style, we went with our own individual style - we made backdrops, decorations and tie dyed the dinner napkins. Tazz tie dyed the silk that was the backing and lining of his vest, he had a tailor in Bristol UK make the vest. 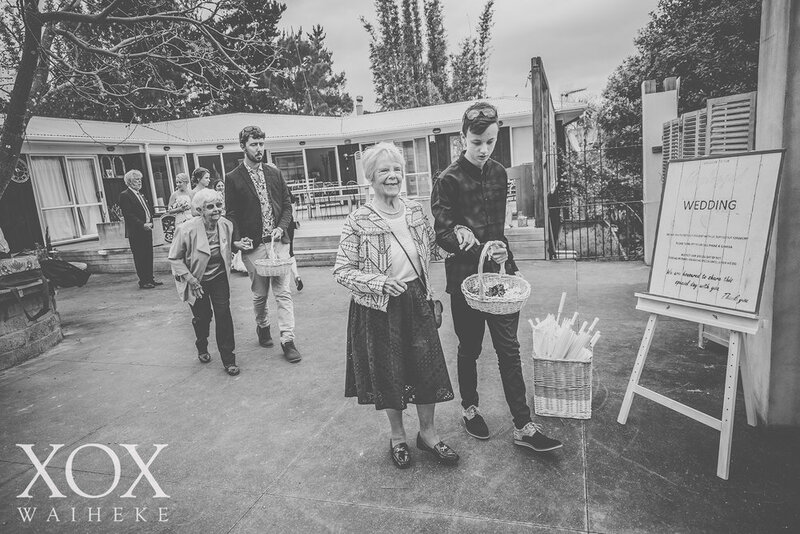 Memorable moments of the day… Asking both our Grandmothers to be my flower girls minutes before the ceremony. Seeing my wedding band for the first time as it went on my finger and being absolutely blown away with how amazing the venue transformed, it was better then we had ever imagined. My Engagement ring was Tazz’s great Grandmother engagement ring from 1932 and my wedding band was designed and made by Tazz’s Uncle Paora Toi Te Rangiuaia, it has an Australian opal and 6 diamonds. 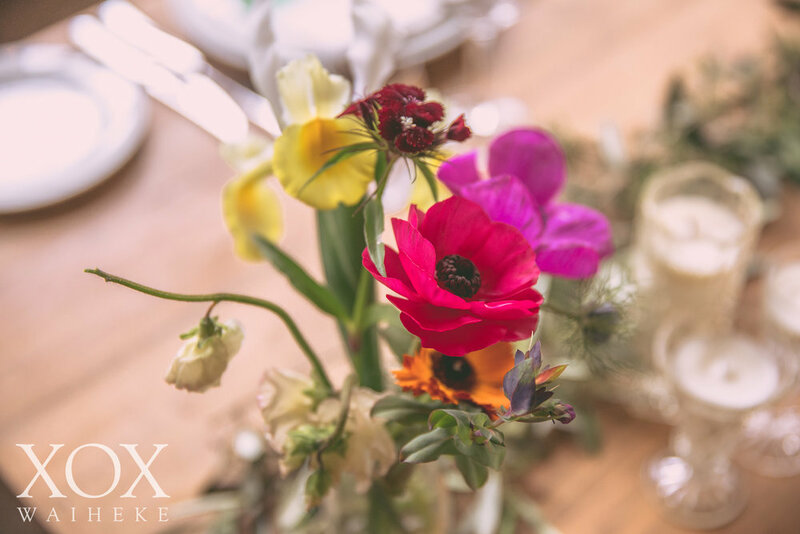 Nourish Gardens Waiheke Island supplied wild flowers for the table centrepieces, we asked for a few buckets of whatever flowers were in season and got a beautiful range of colourful flowers, it was perfect for bringing colour into the room. 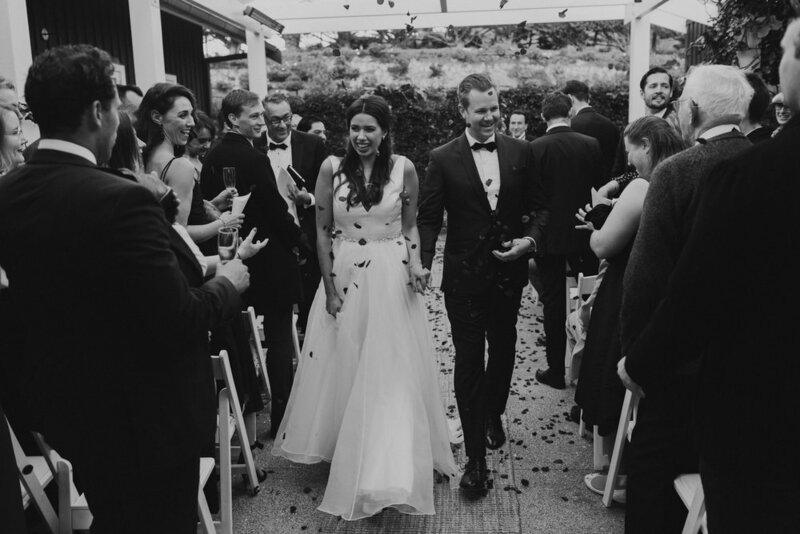 Any advice for other couples planning a Waiheke wedding? 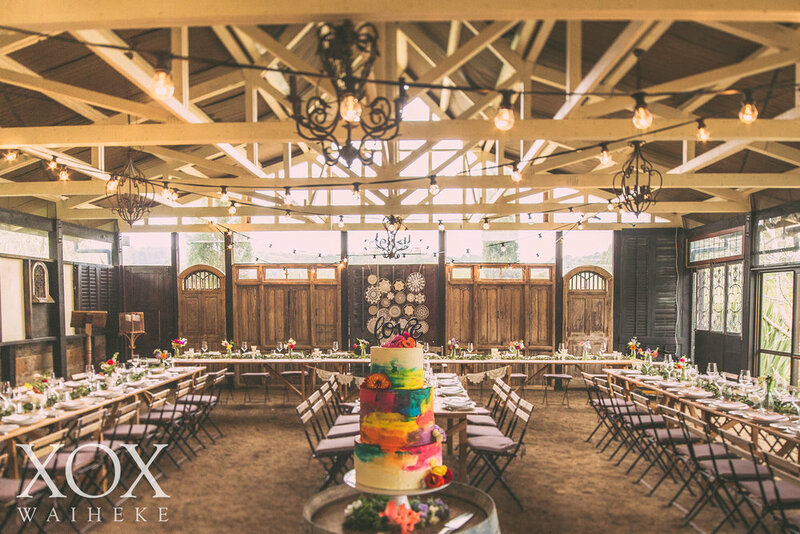 Trust your wedding planner, it can get overwhelming but you are in good hands. There are so many amazing spaces and properties on Waiheke, don’t be afraid to start with a blank canvas.